Montréal, Qué. : Mitsubishi Motor Sales of Canada, Inc. (MMSCAN) gave a peek look at it’s the strategic direction of the brand by unveiling the e-EVOLUTION CONCEPT for the first time in Canada at the 2019 Montréal International Auto Show. A technical prototype, the e-EVOLUTION CONCEPT incorporates the strengths of a sport utility vehicle (SUV), electric vehicle (EV), and the ability to integrate new systems for a connected mobility customer experience. 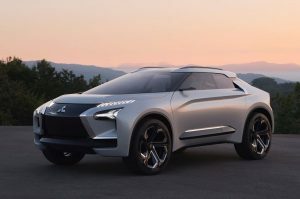 “The Mitsubishi e-EVOLUTION CONCEPT combines SUV and EV attributes, new system appeal, and the powerful performance that’s deep in Mitsubishi Motors’ DNA. The Mitsubishi e-EVOLUTION CONCEPT may be a leap into the future, but it’s an educated one. It clearly signals the company’s drive towards electric mobility, one where vehicles will continue to play a key role in mobility,” said Vincent Cobee. Executive planning officer, Mitsubishi Motors Corp. The e-EVOLUTION CONCEPT uses high-torque, high-performance electric motors, fed by a high-capacity battery system to deliver a smooth and powerful performance. The drive battery is located under the floor mid-ship of the vehicle, providing a low centre of gravity for the utmost driving stability. For exceptional driving performance, the triple motor 4WD system employs a single motor to drive the front wheels, complemented by a new Dual Motor Active Yaw Control (AYC) system that couples two rear motors through an electronically controlled torque-vectoring AYC unit. All of this is integrated into Mitsubishi’s unique Super All-Wheel Control (S-AWC) vehicle dynamic control system, developed on the company’s all-conquering World Rally Championship and Paris-Dakar rally cars. The front face design of the e-EVOLUTION CONCEPT is a fresh take on Mitsubishi’s archetypal “Dynamic Shield” design. The large hexagon shape at the rear draws inspiration from the spare tire cover of the brand’s quintessential SUV, the legendary Mitsubishi Pajero, a hallmark of off-road driving, and one of the iconic chapters of Mitsubishi’s heritage. Inside, the cockpit of the e-EVOLUTION CONCEPT Designers had the space to realize a radically novel cockpit, highlighted by an instrument panel that appears to float in front of the driver. Mitsubishi Motors’ Outlander PHEV recently set a new industry record for plug-in hybrids by selling more than 5,000 plug-in hybrids in a calendar year in November. It helped the company achieve a record year in 2018 following the record year established in 2017. Almost half of Outlander PHEV sales in Canada were made in the province of Québec.